Already greatly appreciated in Japan for a giant 900 m² painting produced in 2011 on the facade of the Sapporo museum (the Miyanomori International Museum of Art), the artist was approached in December 2014 to carry out a 216 metre work at the foot of the D2 Tower at La Défense in the Parisian business district. Indeed, the business district is already filled with an impressive collection of artworks as diverse and varied (sculpture, painting, stained glass windows, frescoes, etc) as the artists themselves (from Calder to Richard Serra, including Miro, Bernar Venet, Takis and César). 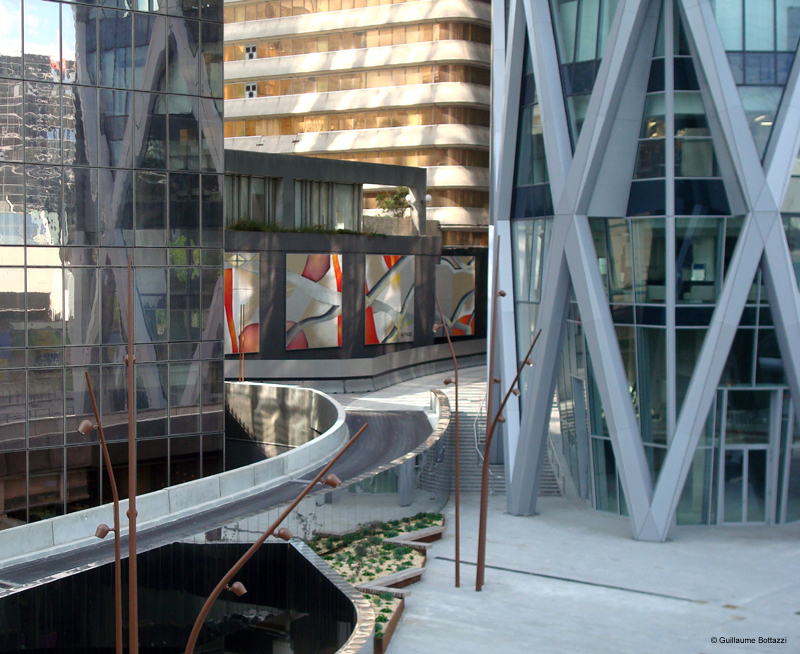 Now there will be an additional work of art at La Défense for people to admire as they walk past the foot of the building. The work will certainly attract and may even intrigue people. For him, the importance lies elsewhere, in the transmutation of the wall into enlightenment. Indeed, for mystics, darkness and enlightenment are one and the same thing. And, in the end, isn’t this distortion or opposition that we thought we perceived between the coldness of the wall and the pictorial warmth of the work just as absolute? Hence the other, not insignificant, question: in his own way, has the artist not also taken a path similar to that of the Brahmin? Could this explain the clearly enlightened nature of his painting? But without the pretension of supplying a definitive, unequivocal answer, the debate will continue. In spite of this, we may say without any hesitation that this artist’s painting seems to marked by an experience comparable to that of Zen. In addition, as though to facilitate the same odyssey, G.Bottazzi uses his tried and tested glaze technique to soften a kind of pictorial severity and permit the voyage to be smooth.Inhis own words, “It brings a great deal of gentleness to the painting”. His painting really cannot be reduced solely to anecdotal detail. 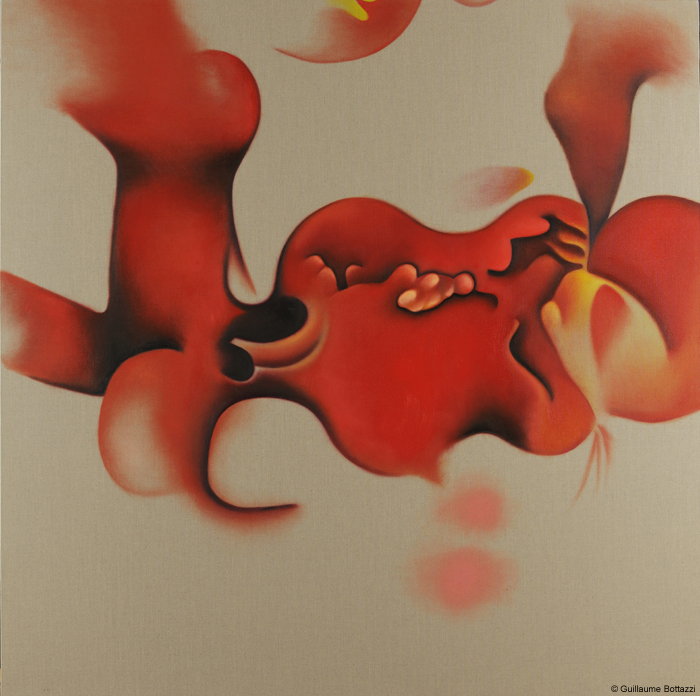 By giving priority to movement, G.Bottazzi quite simply includes his work in a more vast and more prestigious artistic approach, since it follows the path first taken by a certain Kandinsky. Unlike the incisive and intrepid gestures that we find in the work of Koning or Pollock, the work of G.Bottazzi is related more to the disciplined and rhythmic work of an Oriental calligrapher. Sometimes, like many current painters, the artist blithely cross the borders between the organic and the geometric and rediscovers lost visual pleasure. In the 1960s, following the lead of some American painters who rejected the puritan principles of the purity of geometric abstraction, many artists joined the figures of organic abstraction.Their concern was to rediscover the joys of aestheticism. In fact all these abstract painters, such as Brice Marden, often “mix together”. Most of them go on to use organic abstraction to mark their return to Op Art. 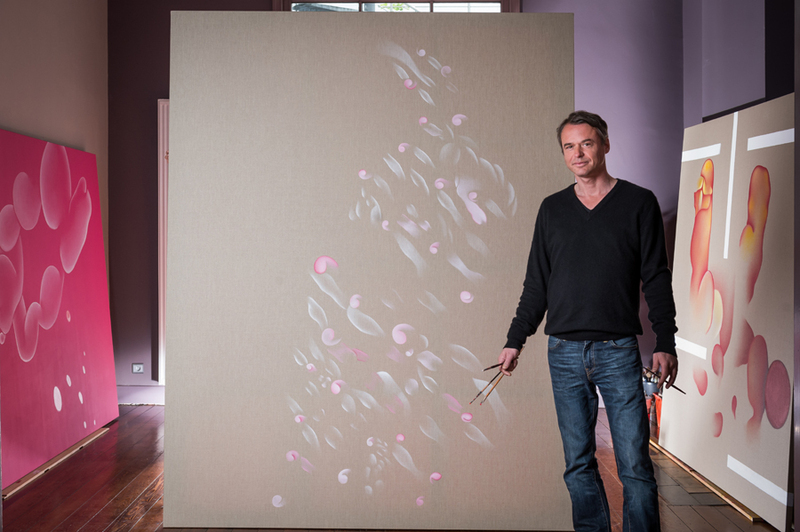 Philip Taaffe and Roos Bleckner rehabilitate a type of art that tends towards beauty. 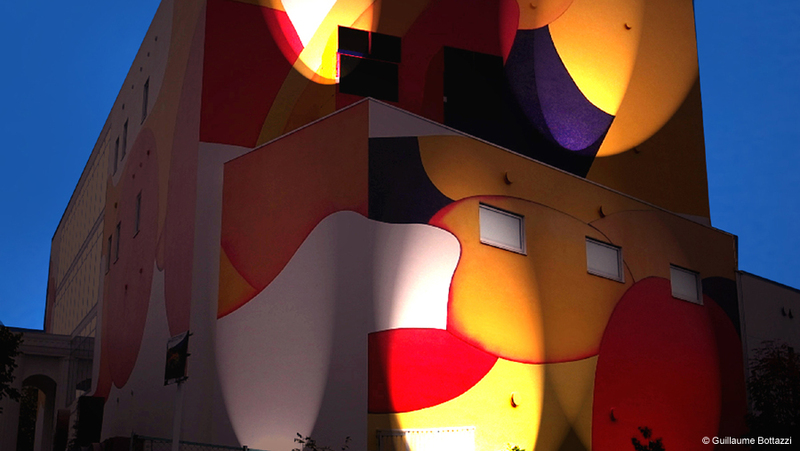 Similarly, we find an identical approach to Op Art with G.Bottazzi. In some of his works, the artist uses vibrant surfaces with the obvious aim of cultivating the “spirit of the eye” (l’esprit de l’oeil). He has no hesitation, either, in mixing the geometric with the organic for sheer pleasure! The artist remains an ardent advocate of floating compositions that make use of all the techniques of perspective, not to mention spatial illusion, in the manner of Al Held. Hence the various evanescent patterns that often seem to be suspended in a zone of weightlessness. In the last canvas, the artist has created an area that is just as magical, still with floating organic shapes and a perspective of depth. This results from the arrangement of the motifs that pirouette and sometimes secretively appear to conceal themselves. This gives rise to an almost unreal beauty close to minimalist austerity. But there is still one question: isn’t this need to return to beauty anachronistic nowadays? Art currently no longer claims to enchant, since, according to Jean Cocteau, “beauty limps”! Yet Dostoevsky’s statement that “beauty will save the world” has never been more true and justified than nowadays. This message is carried and idealised by artists especially who, like G.Bottazzi, enrich the world through this attraction to beauty. In this respect it is useful to recall the words of Bernard Bro concerning the passion of artists: “The passion of artists is not the same as that of saints. But it’s still “passion”.